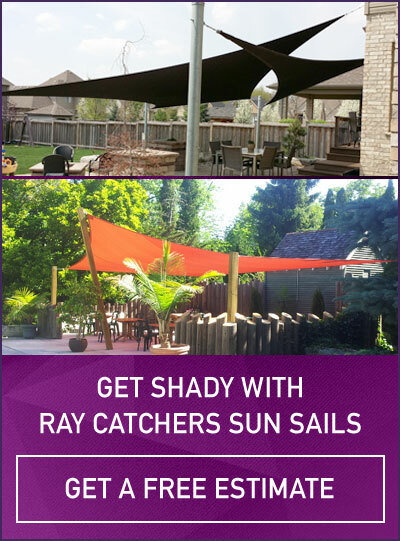 The following guide is to provide information for installation of residential shade sails. If your sail will measure over 1,000 square feet you should consult a professional. Shade Sails are a tensioned shade system consisting of a number of components with many variables. These instructions will guide you through the process. Read through completely before starting your installation. Shade Sails are a versatile product that can be installed almost anywhere in limitless ways. Shade Sails are tensioned canopies so attachment points must be solid structures able to take the load. Varied combinations can be utilized to attach your sail such as existing buildings and large trees (at least 12” in diameter). Make sure that these points are a part of a solid foundation. If additional points are required metal or wood posts can be installed. Proper planning will ensure that your sail will perform the way it is intended and last for many, many years. Sails can be installed in a variety of ways but they must be installed properly to ensure stability. Shade Sails look and perform best when they are installed on a slope with a difference of at least 3 feet in height between one or more attaching points and the more the better. A twist, (see Fig. A and B), is created by diagonal corners high and low; This design creates style but you will sacrifice shade.. A flat sail is not recommended. It can be unstable and you will have issues with water pooling. Because sails are tensioned structures the sails will be approximately 10% smaller than the area outlined by the anchor points to allow for stretch and hardware to tension the sail. They also have a slight inward curve on the edges for tension. It is recommended you set your anchor points 2 to 3 feet wider than the area to be shaded. Determine area to be shaded by considering the position of the sun when you will need shade the most. You need to set your low points toward the direction the sun comes from. Keep in mind the shaded area will move with the sun’s movement. String can be attached to the projected anchor points temporarily to help visualize the footprint of your sail. Leave the string for a couple of days and watch the shadow to see where the shade will fall. Remember, the sails edges are not straight lines, but curved. Shade sails can be any polygonal shape; we make the sail to fit your space. Strength of existing structures; must be solid foundations. Call-Before-You-Dig to locate utilities if additional posts are required. This service is free in most places. Be aware of position of overhead wires as well. Barbeques and fire pits should not be positioned under the sails. Anchor points must be installed before final measurement in order to determine the correct size of the sail. A shade sail can be any shape. Anchoring points can be established by using a variety of existing structures such as houses, garages, pergolas, and large trees that have a solid foundation. Where there are no existing points for anchors, a post can be installed. In certain instances it is possible to extend the anchor point by using a short chain or cable. Long extensions can make your sail unstable and is not recommended. It is best to take your sail attaching point right to the anchor point. The end of the extension becomes the anchor point for measurement purposes. Posts must be a minimum 6”x 6” if using pressure treated wood posts. 6” x 8” are recommended especially for posts 10’ to 12’ in height. Galvanized steel minimum 4” round or square is best; if plain steel is used the posts must be painted to inhibit rust. Aluminum is not recommended. Post should not be taller than 12 feet. If more height is desired you need much larger posts and you should check with a professional. If using metal posts it is recommended drilling holes (3/8”) for the eye bolts before setting the pole in the concrete. Posts must be set in concrete. The footing depth must be equal to ½ the height of the exposed post. Dig a hole 14”-16” in diameter in firm undisturbed ground. Insert a bolt or rod near bottom of round metal post to anchor and keep from twisting. Place post in hole; it is recommended to lean the post 5 degrees away from the centre and can be up to 25 degrees, however if there is more than 1 sail attached to a post it must be straight. Fill with concrete. Finish with concrete sloping away from pole. Temporarily brace the post and allow 48 hours to set before taking measurements. for hardware. It is best to use galvanized or stainless steel anchor hardware. If installing multiple sails that overlap you need to allow 12” between the sail connections to allow for movement of the shade cloth in high winds. The sails should never touch. The friction would eventually cause damage. Precise measurements are very important for a stable sail. Sails are made to fit your unique space. All anchor points should be established and all the necessary hardware installed to your attaching points before this next step. Once set and settled measurements for the sail can be taken. Take measurements from anchor point to anchor point working your way around the perimeter. If your sail has four sides or more, diagonal measurement(s) are needed as in Fig. D and Fig. E. If you are using your own hardware, you will need to subtract the dimensions of the hardware from each side. Your sail has arrived and now you’re ready to install it. Your Red maple Shade Sail comes with stainless steel loops sewn into the corners for attaching. You must purchase additional hardware to install the sail. Choose the appropriate attaching hardware for installing your sail. Shade sails are a tensioned canopy. One or more turnbuckles (depending on size) must be used to properly install your sail. Additional hardware required to install your sail can be purchased through Red Maple Shade Sails or in hardware or fastener stores. You should use galvanized steel or if you live near salt water, stainless steel attaching hardware. These metals won’t rust easily and will have longer life. Use closed style hardware as open eyelets may allow the sail to become detached in strong winds. 3/8 inch turnbuckles, quick links, or d-shackles are recommended. To attach and tension your sail properly follow the installation instructions provided with your sail. The sail must be taken down when snow conditions are possible. Shade cloth is highly stain resistant but sails may need to be cleaned over time. When cleaning use mild dish soap with a low pressure water hose and a soft scrubbing brush. Do not use bleach or other chemicals on the sail. Air dry only; never apply heat to the shade cloth. Do not pressure wash. If these steps are not followed as outlined above, Red Maple Shade Sails cannot be held liable for the defects caused by incorrect installation and warranty of the sail materials is void. Furthermore, Red Maple Shade Sails cannot be held liable for any defects in the installation hardware that has been provided or purchased by the customer.